It’s often difficult for many nonprofit executives to dive into Twitter. To get you started, or sharpen your Tweet-skills, we’ve compiled this guide to Twitter for Nonprofits. It starts with Twitter’s own NGO Handbook: Campaigning on Twitter. The NGO handbook is an extremely useful tool to go by when you’re using Twitter as a nonprofit. It starts out with the basics, dives deeper into strategy, and finally ends with case studies to show examples of their methodology in action. 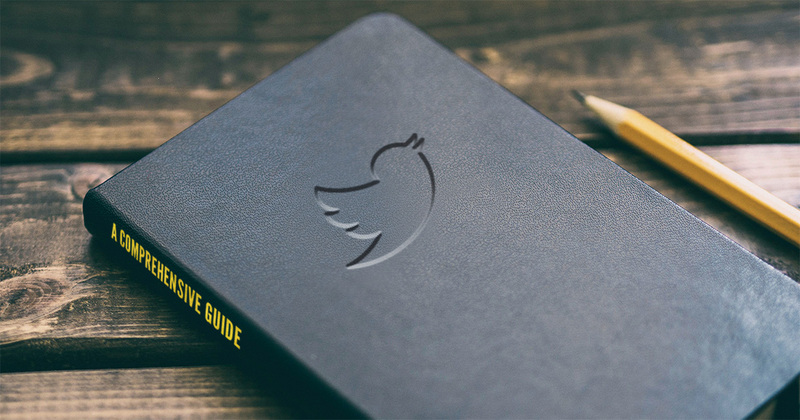 Twitter’s handbook begins with some of the same basics we covered in our own Twitter 101 article, but it also discusses some main mechanics of the platform that are important to note. The length of a Tweet is limited to 280 characters. This includes your hashtags and links. The handbook includes basic Twitter terminology with definitions of words like “tweet” as a verb versus noun, etc. Twitter’s handbook also describes in-depth how to post a tweet, create a curated moment, and more. People find you on Twitter in a wide variety of ways, so setting up your profile properly is in your best interest. It begins with choosing your name. Your username is your identity on Twitter. It can only be up to 15 characters, so sometimes the full name of your organization is not plausible. The trick is finding the balance between Twitter’s limitations and your organization’s recognizable identity. Using your @username on your printed and other digital promotional materials will also help boost your Twitter name recognition and following. Your Twitter bio is the short description on your profile page and can be up to 160 characters. This section is another way in which people can find you. Choosing one strategic hashtag here can go a long way. Choose a hashtag that is popular, hits your target audience, and defines your cause. 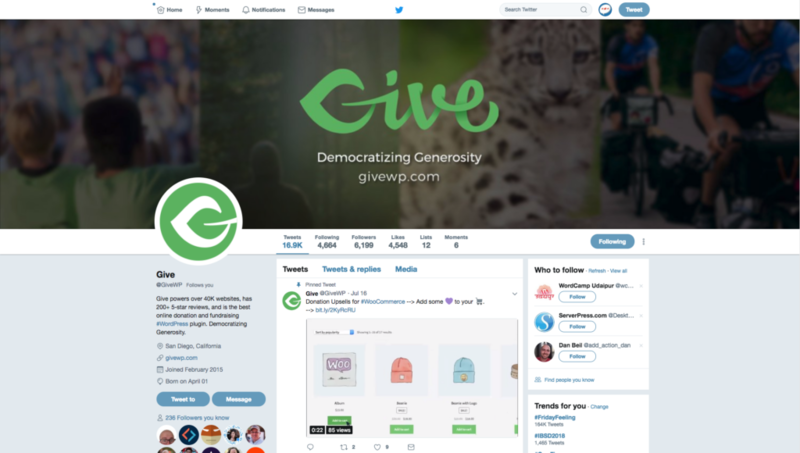 The GiveWP Twitter page has a custom header photo, the Give logo as a profile photo, a short bio with a strategic hashtag, a number of lists, and a collection of moments. The rest of the components of your profile include tweets, photos, people you’re following, your likes, people who follow you, your lists, and your moments. These things are generally auto-populated as you thrive on Twitter, with a few exceptions. Moments are created by curating a series of Tweets and putting them into one post. Creating a moment will notify everyone you included about it. It’s also a good practice to occasionally go through and clean out the list of people you follow. Start with those who are most inactive and move on to people who don’t follow you back or don’t post relevant content. The best way to do this is with MangeFlitter, or a similar tool. Now that you have your profile set up and you understand the basics of Twitter, it’s time for the first tweet. Your first tweet is crucial. What will you put into the Twittersphere to define your organization? The CIA’s first tweet was simple and to the point. It also defined who was speaking and how they would speak in the future. As a nonprofit, it’s important to maintain your authenticity. People want to know what’s happening behind the scenes when they donate to your cause. Share your experiences with a predefined hashtag. Post as your organization and as individual team members. There are 3 components of good tweets: Insight, personality, information. Use media and a lot of it. Varying the types of media you share will also increase the chances that people pay attention to it. Different things attract different minds. Use videos, photos, GIFs, and polls: anything that Twitter will allow now and in the future. The tweet below shows a little bit of the work The Honey Bee Conservancy is doing, uses media-rich content, strategic hashtags, and the voice of the organization. You can also use Twitter to connect with people who care about your cause, potential donors, and your donor base. Twitter Q & A is a way to conduct a structured question and answer session live throughout a specified time frame, using a predefined hashtag. When conducting any kind of social media campaign, those within your organization are some of your best assets. Turn board members, organizers, and volunteers into social media ambassadors. Don’t be afraid to encourage your volunteers and those who might benefit from your nonprofit’s work to tweet about it (where appropriate). Once you’ve executed a successful campaign or event, document it with a moment. Curate the tweets and select a header image. Then enter a title and description before you post it. Send it out to your email list so all your donors can see what your organization has been up to as well. There is no one answer to how often to Tweet, but consistency is best. It’s also important to remember that Twitter is like a conversation. The content flow is short and fast-paced, but it has a lot of depth. Photos Tweets: Photos are great on Twitter. They have a 35% higher retweet rate than a normal tweet and you can include up to four photos. Photos are also strategic for your tweet length because you can tag up to ten people and it doesn’t count toward your character count. Videos: Videos can be up to 140 seconds in length so they provide a little more context than a GIF or a photo. It’s smart to use subtitles in a video tweet because many Twitter users don’t have their sound turned on. GIFs: GIFs produce movement immediately, versus a video which starts as a static image. This automatically engages a user’s eye and gets them involved. Polls: Use a poll to engage your audience and make them feel involved. You can even use it to determine what your next campaign should be. This tweet invites real-world action versus a simple retweet. The action that they chose will likely encourage users to interact with that tweet and post some of their own using the associated hashtags. Lastly, you can use purchased ads and promotions to boost your visibility on Twitter. Target key audiences and get your message across with some of your most interacted with content to supplement your organic efforts. Use Twitter to campaign for your cause in a variety of ways. Proactively, you can pre-plan a multitude of scheduled content, engage in real-time, and supplement your planned content with interactions and additional posts. When doing any kind of campaigning on Twitter, always use a hashtag. It will make it easy for people to find you in the moment as well as quicken the time it takes you to compile your Twitter Moment later on. When choosing a hashtag, remember to use capitalization to make it easier to read and try to find a catchy phrase that hasn’t been actively used before by anyone else. 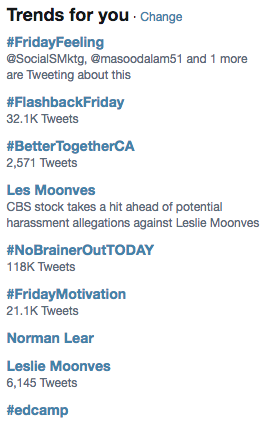 You can also take a look at the trending topics to the left side of your dashboard to see what’s being talked about and if anything is relevant. If you do find a relevant topic, engaging with this trend will increase the visibility of your campaign as well. Use the various types of Twitter post strategies to help your campaign along. Host a Q & A, go live with their Periscope feature and hold a contest. Twitter is flexible. You should also consider putting the Twitter bird and your username or campaign hashtag on all your promotional materials. This will encourage people to participate in posting about your cause. Reactive campaigning requires a bit more on-the-spot thinking and creativity. An example of reactive campaigning would be an emergency fundraiser for the victims of the Greek fire that started last week. Those who want to help might consider using a hashtag already in circulation rather than their own. Another is to provide assistance in the event of an emergency, while it’s still happening. Twitter talks about this in their handbook thoroughly. You can use the hashtag to signal to people that there is help where you are, or that you can provide help in some way. The main point is that things happen and you need to be ready for a reactive campaign. We suggest creating an outline of how you will handle a reactive campaign. Who will respond, how, and what resources will be needed? Aside from campaigning, Twitter can also be used for networking and organizing your volunteers and donors. Hashtags organize your conversations and help you keep things together. We use #TeamGive with any Tweet that talks about a team member. You might also host a “Tweetup.” This is an online event that brings people together to talk through Twitter. It’s somewhat like the Q & A, but more like a general conversation than one person responding to questions. There are a few ways you can help increase your Twitter engagement and following on your own website as well. Use the following tools to include social media optimization in your website build. Include Twitter icons with links to your page. Show share buttons for posts. Include tweetable content in posts and on key pages. Embedded tweets into your content. Below is a list of the additional tools provided by Twitter to help make campaigning on Twitter meaningful and easy. Analytics track your campaign success with follower growth, quality, and engagement. It also tracks your reach and your traffic through to your website from Twitter. Tweetdeck is the scheduling and monitoring tool that Twitter provides for free. With Tweetdeck, you can be logged into multiple accounts at once and allow team members to access your account without giving them the password. Periscope was already discussed a little, but this live tool is wonderful for nonprofits because it gives a sense of transparency to your audience. Donors love to know how their money is being spent. Some examples of the best ways to use this feature are with clips of behind-the-scenes, live events broadcasts, launching a campaign or initiative, interviewing spokespeople, holding contests, and more. Twitter includes much more detail in their downloadable handbook for campaigning, including case studies. You can get the book from Twitter using the button below. Have you discovered more Twitter tips or tricks? Share anything you’ve found on Twitter for nonprofits with us in the comments.